SAN DIEGO, CA – Sept. 4, 2018 – The fourth annual GI Film Festival San Diego is getting ready to roll from Tuesday, Sept. 25 through Sunday, Sept. 30, 2018. Organizers have once again curated a film lineup to feature the untold and underrepresented stories of America’s military through film. The six-day San Diego military film festival features 34 films, including nine world premieres and five West Coast premieres, as well as several screenings, filmmaker appearances, and panel discussions. GI Film Festival San Diego attendees have opportunities to watch the films, meet filmmakers and film subjects, and have conversations to tackle topics that are usually unspoken. 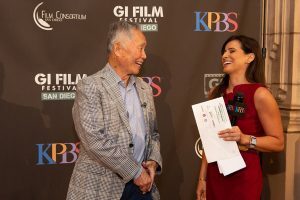 The GI Film Festival San Diego is one of only a few film festivals in the entire United States to exclusively feature stories for, by, and about military service members and veterans. Film selections focus on several different topics, and attendees see a glimpse of what military service members, and their families, have done and sacrificed for the United States. This year, films feature diverse stories including LGBTQ+ military members, women service members, the themes of resiliency and recovery, and caregiving post-deployment. Selections also highlight multicultural military experiences from the Hispanic, African-American, Asian and Israeli point-of-views. The six-day San Diego military film festival begins with the ever-popular Opening Night Screening and Reception on Tuesday, Sept. 25 from 7 p.m. to 10 p.m. at the Museum of Photographic Arts in iconic Balboa Park. The evening includes screenings of the narrative short “American,” followed by the documentary short, “The Registry.” Special guest George Takei, who is the lead actor in “American,” is anticipated to attend the Opening Night Screening and Reception. Both films focus on World War II events and emphasize the important roles and services that Japanese-American military members provided throughout the war. In addition to Takei, the directors of each film are expected to attend the Opening Night celebration and will participate in a panel discussion after the screenings. Screenings then continue through Friday, Sept. 28 at the Museum of Photographic Arts. The festival moves to UltraStar Cinemas at Hazard Center for the Saturday, Sept. 29 and Sunday, Sept. 30 screenings. “From Baghdad to The Bay,” a documentary feature focusing on an Iraqi refugee and former translator for the U.S. military who struggled to rebuild his life in the United States while coming out as an openly gay man. “When the Smoke Clears,” a documentary feature that tells the true stories of young Israeli soldiers whose injuries, both mental and physical, leave them fighting for the strength to live. “ Stubby: An American Hero,” an animated family-friendly feature about young Army Pvt. Robert Conroy and his stump-tailed terrier who embark on an adventure during World War I that would define a century. “The Hello Girls: The Story of America’s First Female Soldiers,” making its West Coast Premiere at the GI Film Festival San Diego, this documentary short reveals the relatively unknown story of 223 American women who served overseas during WWI as telephone operators. “The Dark Resurgence,” a narrative short created by a local veteran and festival newcomer, Michael “Mike the Marine” McCumber, this “Star Wars” fan film tells tale of an old Sith Empire emerged from the shadows to seize control of the galaxy. “I Am That Man,” making its World Premiere at the GI Film Festival San Diego, this 87-minute narrative feature follows John Beckett as he struggles to adjust to civilian life and the breakdown of his marriage. As he considers returning to his life as a Navy SEAL, he is faced with the decision to avenge a murdered friend and mentor. “Kilimanjaro Warriors: A Monumental Goal for Recovery,” follows a group of amputee military veterans who set forth on a monumental goal for physical and spiritual recovery, training and climbing the world’s tallest free-standing mountain, Mt. Kilimanjaro (19341 ft) in Tanzania, Africa. “We Are Not Done Yet,” a documentary short about 10 U.S. veterans of varied backgrounds who come together at a poetry workshop to combat their traumatic military pasts through the art of written word. “Black Jack Pershing: Love and War,” an award-winning documentary that tells the story of General John J. Pershing’s military career and his personal life, including tragedies seldom examined. Twenty months after America entered WWI in April of 1917, General Pershing and two million troops helped turn the battle tide. All Access Passes, general admission tickets for the Opening Night Screening and Reception, as well as the rest of the festival screenings are available now at GIFilmFestivalSD.org. All of the events will be open to the public with discounted opportunities for active duty personnel and veterans. All Access Passes and tickets available on GIFilmFestivalSD.org. KPBS serves San Diego and Imperial counties with trusted news and programs that inspire, respect and educate. KPBS delivers this content to more than one million audience members weekly via multiple outlets, including television, radio, and digital media. As a public service of San Diego State University, education is a core value – from our children’s programming to our local news coverage. KPBS is committed to being a reliable source for in-depth, thoughtful, and high-quality content. For more information, visit kpbs.org. The following films (in alphabetical order) are confirmed for the GI Film Festival San Diego this year at either the Museum of Photographic Arts in Balboa Park or UltraStar Cinemas at Hazard Center. Titles are subject to change.